Ten-year-old Sarah Murnaghan is waiting for a lung transplant while struggling with cystic fibrosis. Her parents say she should be at the top of the list, but because she is younger than 12, rules require her to wait for a child's lung. NBC's Tom Costello reports. U.S. Health and Human Services Secretary Kathleen Sebelius reiterated Tuesday that she won’t intervene in the “incredibly agonizing” case involving a 10-year-old Pennsylvania girl who is waiting for a lung transplant. Medical experts should make those decisions, said Sebelius, who was grilled by Republicans at a Congressional hearing about the situation involving Sarah Murnaghan, who has end-stage cystic fibrosis. “I’m begging you … Sarah has three to five weeks to live. Suspend the rules until we look at this policy,” Rep. Lou Barletta, R-Pa., told Sebelius at a session of a House Education and Workforce Committee hearing. “Forty people in your home state are waiting for a lung,” Sebelius countered in the exchange in which the pair spoke over each other. Rep. Tom Price, R-Ga., a former doctor, told Sebelius that it would only take her signature to allow Sarah greater access to the life-saving organs. Sarah’s parents are challenging current policy that prevents children younger than 12 from receiving adult organ transplants until all adults and teens on the list have been offered the organs -- even if the children are sicker. Younger patients receive priority for pediatric organs matched for size and age, but there are far fewer children’s organs available. Janet and Fran Murnaghan of Newtown Square, Penn., said they want Sebelius to intervene on behalf of all young children waiting for lung transplants, not just Sarah. The change would add perhaps 20 children to the list that includes nearly 1,700 patients. 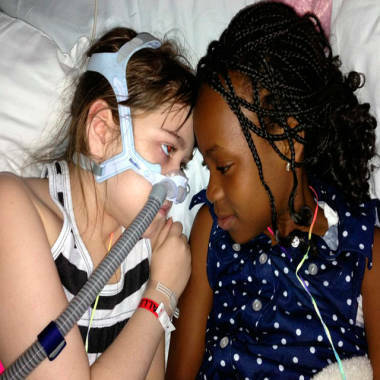 Sarah Murnaghan, left, lies in her hospital bed next to adopted sister Ella at Children's Hospital of Philadelphia. Her family wants an exception made for Sarah to get an adult lung, because so few pediatric lungs become available. Kathleen Sebelius, U.S. Secretary of Health and Human Services, says she doesn't want to intervene in transplant decisions when other children are just as sick. Sarah's relatives say they want the policy changed for all children awaiting a lung transplant, not just Sarah. But Sebelius and transplant experts said the organ allocation system exists to ensure fairness to all. Any changes must be made by the Organ Procurement and Transplantation Network, or OPTN, which has a specific process. Sebelius last week requested an urgent review of policy, with a particular emphasis on increasing available organs for children. That process would take months. In the meantime, Sarah would likely die, her parents say. The Murnaghans appealed Sunday for a directed lung donation from any family who tragically loses a loved one in the near future. Such a donation could be designated for Sarah, transplant experts say.